Dear “Catalyst” Diary… Vol. 8 – Happy Halloween! I wanted to use this appropriately spooky holiday to announce that December 1st will be our first day of Catalyst shooting! Our Effects Supervisor Lucien Harriot will host our first big production meeting at his Mechanism Digital studios. So the countdown has begun! Meanwhile, since it is Halloween, I would like to share with you a treat. One of the best ghost story donations was just released on “The Catalyst” site. 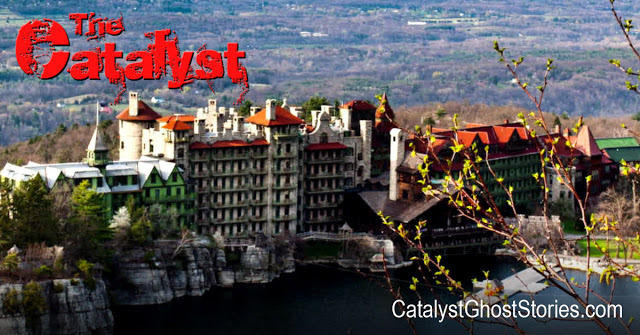 Thank you Angie Speranza for your creepy true story about the Mohonk Mountain House resort, pictured below. CLICK HERE TO SEE ANGIE’S VIDEO. It is 4 minutes and I think you’ll find it worth the time.